We had a party of 6 on a Friday night and had to wait a few minutes in the bar for our table. The Zingerman’s family takes the sourcing of their products very seriously, and they were doing the local thing way before it was in vogue. And if it ain’t local, it’s the best damn thing you can get from far away. 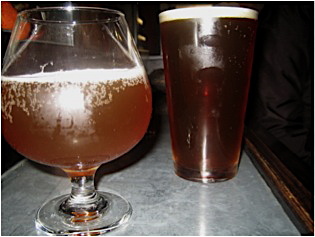 So I started with a locally produced Zaison, a Belgian beauty created the Roadhouse’s bar manager at a brewery up the road, and my wife Jennifer had a Boont Amber Ale from Anderson Valley Brewing in Boonville, Calif.
On the Roadhouse menu one finds various all-American delights. The whole thing has a southern bent, with sections for BBQ, Mac & Cheese, Fish, and Burgers. 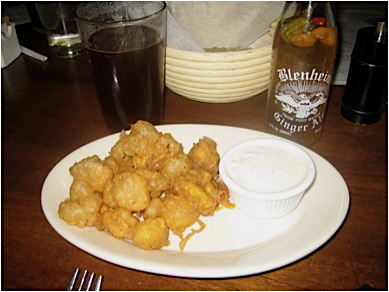 My sister went to Wisconsin for college though, so for an appetizer we couldn’t resist going Midwest with the fried cheese curds. They ended up being the most ridiculously good gobs of goo you can imagine. These aren’t your typical breadcrumb-coated squeakers…more like what happens when a James Beard nominated chef (yes, they have one of those in Alex Young) takes over the recipe. For entrées, we had the BBQ Pork Entrée with Eastern North Carolina Vinegar BBQ Sauce, Pit Smoked Beef Brisket, sautéed Georges Bank scallops, the Roadhouse Macaroni & Cheese, and a Bacon & Blue Burger with Nueske’s (of course) and Point Reyes Blue Cheese. They were all fantastic and masterfully demonstrated their own little highlights of American cooking. Here’s where it gets interesting. We told our server that I was snapping pics for a blog post, to which she suggested if she were writing a blog about Zingerman’s she wouldn’t limit herself to just one establishment in the empire, which consists of the deli, the roadhouse, a creamery and a bakehouse. She would go on the “Tour de Food.” The Tour de Food, as it turns out, is a challenge to visit all four retail locations in the empire in one day in order to win something that stirs the soul of any red-blooded American — a T-shirt. Eyes darted around our table in excitement. Suddenly this blog post had real purpose. We were going to do the Tour de Food and share its glories with the esteemed readers of Elizabites. And we were in a race against time. It was already 9:30PM, and we had one down. Our server signed our “TDF” passports and we raced to make it to the deli by closing time (10PM). We burst through the doors of the famous deli around 9:45PM. At most mortal establishments 15 minutes before closing is a time that elicits stink-eye looks from the staff, but not at Zingerman’s. “Hi! Come on in, welcome to Zingerm – wait, aren’t you the Reids?” Not only was everyone there unreasonably delighted that we were extending their Friday night shift, but Dave, the bread guy remembered my Mom and sisters by name from a week earlier. Instead of asking “can I help with something” or “any questions”, he says “what do you guys want to try?” And thus began about 20 minutes of trying different kinds of bread—Parmesan pepper, Pain de Montagne, 8-grain 3-seed, Peppered Bacon Farm Bread (you read that right), Chocolate Cherry, and Pecan Raisin, to name a few. Dave, it seemed, was content to feed us samples all night and educate us on the various traditional baking methods employed at the Bakehouse, and for that we salute him. Here’s to you, Mr. Gives-us-free-bread-and-loves-the-science-of-baking-more-than-anyone-we’ve-ever-met-guy. Thanks Dave. I took a couple shots of the cheese and meat case on the way out to give any of the uninitiated a glimpse of how ridiiiiiculous this place is. Two down, two to go, and luckily they were right next door to each other. 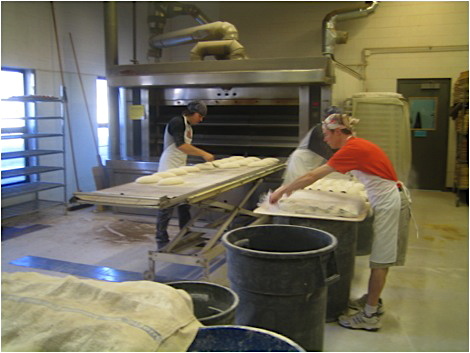 We were up and out the next morning to hit the Bakehouse and Creamery well within our 24-hour window for the Tour. As we’ve come to expect from Zingerman’s, at the Bakehouse they don’t just sell you bread, they invite you back into the Bakehouse to watch cool kids in bandannas knead the dough and work the ovens. We weren’t in the store five minutes and already we were sniffing fermenting sourdough and being lectured on the logistics of accommodating the varying baking times for around 20 different types of bread. We bought a challah and went next door to the creamery. Same deal – like cheese, will eat. We tried Little Dragon tarragon goat cheese, Great Lakes Cheshire, Montgomery Cheddar, and something they call a Lincoln Log. We turned in our stamped passports, collected our shirts, and went next door to the newly opened Zingerman’s Coffee Roasting Co. (these guys do it all) to savor the smell of success, and of coffee. 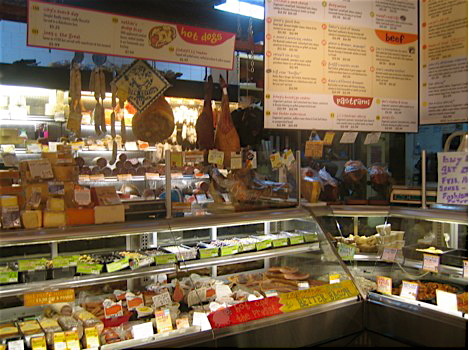 Had my first Zingerman’s experience 2 weeks ago on a trip to Ann Arbor. As a former New Yorker, I always order the corned beef sandwich when trying out a new deli and Zingerman’s version was one of the few to pass the test with flying colors. Plus, the overall experience created – selection, service, etc. – is among the best you’ll ever encounter anywhere.